Eaton S. Barrett—Woman. Pt. I. L. 141. 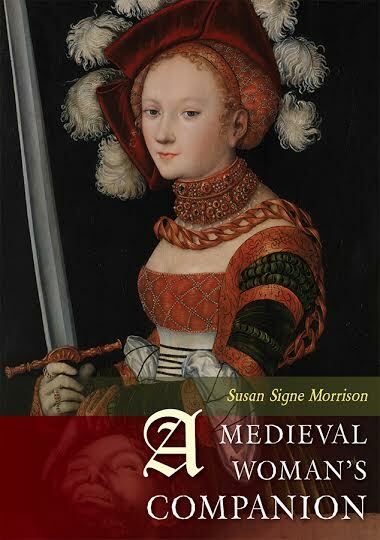 Mary Madgalene was a pre-medieval woman who inspired women in the Middle Ages. However, there is a great confusion surrounding her person. On the most basic level, Mary Magdalene was a woman who lived in the time of Jesus of Nazareth and was one of his most devout followers. But there are other details about her life that are a little bit more confusing. She is often remembered as strictly a reformed prostitute, although there is no explicit Biblical textual evidence that this was the case, whereas the truth of her identity is often concealed in overlooked mentions in Scriptures. 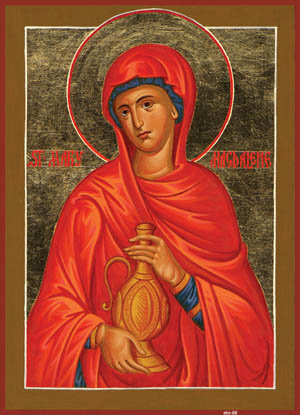 John 4 – Mary is associated with the Samaritan woman at the well with multiple husbands. John 8 – Mary is depicted as the woman caught in adultery and brought into the street to be stoned. In the very next chapter, Mary Magdalene is referenced by name as a different woman, “from whom seven demons had come out.” How is it logical to assume that she is the woman from the preceding chapter? Mark 14:3 – Mary is believed to be the repentant woman that anoints Jesus’ head with burial oil in Simon the leper’s house. Never in the four Gospel accounts is Mary Magdalene referred to as a prostitute. Rather, she is portrayed as a close companion of Jesus, following him everywhere he goes. She is the woman from whom seven demons were expelled, the woman that was with Jesus, The Virgin Mary and John while Jesus died on the cross, and the woman to whom Jesus first appeared after his resurrection in the gospel according to John. More accurately, Mary Magdalene was a pioneer of the early Christian church, acting as a leader for the early women that followed Jesus, much as Simon Peter did for the men (Kennedy). She receives a very clear identity in Luke 8:2, which says, “And the twelve [disciples] were with him, and also some women who had been healed of evil spirits and infirmities: Mary, called Magdalene, from whom seven demons had gone out.” What a woman! Jesus healed her of seven demons, and now she holds a special place in the following of Jesus, being referred to by her name, an honor that even the disciples did not receive in this account. As mentioned, Mary Magdalene was on the hill Golgotha as Jesus was crucified, standing alongside the Apostle John and Jesus’ mother. When all of the other men had left, Mary Magdalene remains. She was one of the first people that saw the resurrected Jesus. Imagine that – a poor woman, with no social standing, having the responsibility to go and tell all of the men that Jesus had indeed risen from the dead. She truly earns a reputation of honor and respect, as she overcame significant social barriers in order to serve her Lord the way she did in the Gospels. Mary Magdalene, long understood to be a sexually immoral woman, came to be known also through “Magdalen Houses.” These homes, meant for the rehabilitation of sexually exploited women and former prostitutes, came about in the middle ages. One such institution, called London’s Magdalen Asylum, was in operation from 1758 to 1966. The houses themselves have a reputation for cruelty and inhumanity that is disputed greatly, especially among anti-Catholic critics, yet many reports of the institutions suggest the opposite (Donohue). However, one of their great impacts is that the association with Mary’s name, based on the story from Luke 7, led to a large assumption that the Mary of the Bible was a prostitute, too. Donohue, Bill. “Myths of the Magdalene Laundries.” Catholic League RSS. N.p., 15 July 2013. Web. 23 Apr. 2014. Kennedy, Tammie M., Mary Magdalene And The Politics Of Public Memory: Interrogating The Da Vinci Code (Feminist Formations, 2012): 120-139. MLA International Bibliography.